(Phys.org)—NASA's Fermi Gamma-ray Space Telescope has once again proven that it is an excellent tool to search for rotating neutron stars emitting beams of electromagnetic radiation, known as pulsars. A team of astronomers, led by H. Thankful Cromartie of the University of Virginia, has recently used the 305-meter Arecibo radio telescope in Puerto Rico to observe unidentified sources of gamma rays detected by the Large Area Telescope (LAT) onboard the Fermi spacecraft. As it turns out, six of these objects indicated by LAT are rapidly rotating neutron stars, with periods of a few thousandths of a second, called millisecond pulsars (MSPs). The scientists published their results online on Jan. 20 on the arXiv pre-print server. The objects of the study were chosen from the LAT's 4-year point source catalog. The astronomers chose 34 from over 1,000 unidentified sources of gamma rays to observe them in detail with the Arecibo telescope. The catalog provided crucial spectral data that helped distinguish possible MSPs from other gamma-ray-emitting objects, like active galactic nuclei (AGNs). "Overall, the search for MSPs in the galactic disk has been made extremely efficient by employing Fermi-LAT data in selecting radio search targets," the researchers noted in their paper posted on arXiv. Arecibo observations were conducted from June to September 2013. The telescope's raw sensitivity and its large gain makes it a very efficient tool for finding millisecond pulsars. 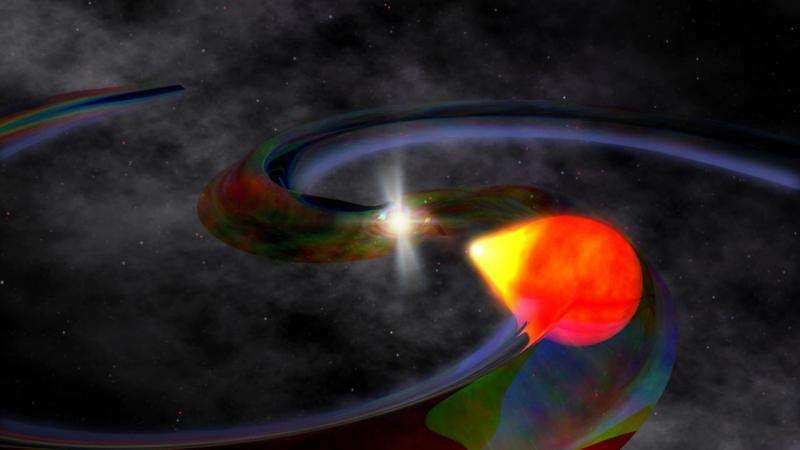 Thanks to Arecibo, the researchers were able to detect six MSPs with rotation periods ranging between 1.99 and 4.66 ms. One of the newly detected pulsars is a typical neutron star, a white dwarf binary with an 83-day orbital period. According to the research, the other MSPs are in interacting compact binaries wit orbital period less than eight hours. Three of the discovered pulsars were categorized as "black widows" and two as "redbacks," while one is a more classical neutron star-white dwarf binary. "Black widows" are neutron stars in which much of the mass has been stripped away or accreted by the pulsar, leaving a companion with a mass less than 0.1 the mass of the sun. In contrast, "redback" is a term coined to describe binaries in which the pulsar is frequently eclipsed by outflows from a companion weighing over 0.1 solar masses. The fastest MSP discovered by Cromartie's team is a "black widow" designated PSR J2052+1218. Located about 7,400 light years from the Earth, it has a pulse period of 1.99 ms. The pulsar is also intriguing for the scientists due to its short binary period, only 2.6 hours. The "slowest" one is a "redback" that received designation J1048+2339. It has a spin rate of 4.66 ms, orbital period of six hours and is approximately 2,160 light years away. The odd neutron star-white dwarf with an orbital period of 1980 hours was named J1824+10. It is located about 8,160 light years from our planet and has a pulse period of 4.07 ms.
Other MSPs include two "black widows": J1805+06 and J0251+26, having spin periods of 2.13 and 2.54 ms respectively. The second "redback" spins at a rate of 2.56 ms. According to the scientists, 17 other still unidentified sources indicated by LAT are strong MSP candidates and need follow-up observations to eliminate uncertainties. Overall, 30 percent of known millisecond pulsars in the galactic disk have been detected in previously unidentified sources of gamma rays pointed out by Fermi. These auspicious results herald more future findings regarding rapidly rotating neutron stars. We have discovered six radio millisecond pulsars (MSPs) in a search with the Arecibo telescope of 34 unidentified gamma-ray sources from the Fermi Large Area Telescope (LAT) 4-year point source catalog. Among the 34 sources, we also detected two MSPs previously discovered elsewhere. Each source was observed at a center frequency of 327 MHz, typically at three epochs with individual integration times of 15 minutes. The new MSP spin periods range from 1.99 to 4.66 ms. Five of the six pulsars are in interacting compact binaries (period < 8.1 hr), while the sixth is a more typical neutron star-white dwarf binary with an 83-day orbital period. This is a higher proportion of interacting binaries than for equivalent Fermi-LAT searches elsewhere. The reason is that Arecibo's large gain afforded us the opportunity to limit integration times to 15 minutes, which significantly increased our sensitivity to these highly accelerated systems. Seventeen of the remaining 26 gamma-ray sources are still categorized as strong MSP candidates, and will be re-searched. Incredibly interesting objects. They provide ways to probe extreme physics and extreme states of matter. cosmology vedas Interlinks-Inspire Knowledge base. I am inventor of Omni-Antenna -tested wide band -this frequency at 327 MHZ is very interesting -and the data provides Space confirmatory Index. PSR J2052+1218-7400 LY, J1048+2339 at 2160 LY,J1824+10 at 8160 LY - are helpful in triggered mode Conscious search for transition regions- partly identified steps in my books. Many thanks for the information- 34 out of 1000- identiefied sources-pulsars.